Tannic acid, a polyphenolic compound, is a CXCL12/CXCR4 inhibitor with antiangiogenic, anti-inflammatory and antitumor activity. Reparixin(Repertaxin) is a inhibitor of human CXCR1/R2 and rat CXCR2 receptor activation. 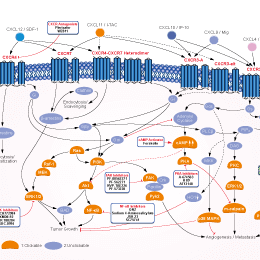 It also inhibits human CXCL8 receptor activation. Plerixafor 8HCl (AMD3100 8HCl) is the hydrochloride of Plerixafor, a chemokine receptor antagonist for CXCR4 and CXCL12-mediated chemotaxis with IC50 of 44 nM and 5.7 nM in cell-free assays, respectively. BLI of NSG mice engrafted with BV173, treated with no therapy (control), plerixafor: 1 mg/kg IP daily, ESKM 100 ug twice weekly, and a combination of ESKM and plerixafor. (A) Logarithmic plot of BLI of leukemia growth measured weekly. Error bars are 5-95% confidence intervals. There was a small but not significant difference between ESKM and combination treated group. (B) End of therapy (day 34) BLI. Plerixafor (AMD3100) is a chemokine receptor antagonist for CXCR4 and CXCL12-mediated chemotaxis with IC50 of 44 nM and 5.7 nM in cell-free assays, respectively. WZ811 is a highly potent competitive CXCR4 antagonist with EC50 of 0.3 nM. a. Gelatin degradation by NCI-H460/R and COR-L23 cells treated with DOX, PF-573228, WZ811 and their combinations for 24 h. Images were captured using a 20× objective on a fluorescence microscope and representative examples are presented on the left part of the panel. At least 100 cells were analyzed per experiment. All experiments were performed at least three times. Merged channels show fluorescent gelatin (green), actin (red) and nuclei (blue) staining; dark areas represent spots of degraded gelatin. Scale bar = 100 μm. Corresponding histograms for each cell line are presented in the right part of the panel showing percentages of degraded gelatin areas relative to the cell volume. Each bar represents mean value ± S.E. * indicates p < 0.05 compared to untreated control cells; # indicates p < 0.05 compared to cells treated with PF-573228; $ indicates p < 0.05 compared to cells treated with WZ811. AMD3465 is a monomacrocyclic CXCR4 antagonist. (G) Concentration-dependent inhibition of cell proliferation in SKOV3 cells (* P ≤ 0.005) treated with SB225002 (0.625, 1.25, 2.5 and 5 μM) for 2 days was revealed using XTT cell proliferation assay. (H) Western blot analysis confirmed that TAK1/NFκB signaling was inhibited dose-dependently in SKOV3 cells upon treatment with SB225002 (1.25 and 2.5 μM) as compared with untreated control. LIT-927 is a novel neutraligand of CXCL12 with Ki value of 267 nM for inhibition of Texas red-labeled CXCL12 (CXCL12-TR) binding. It shows high selectivity toward CXCL12 vs other chemokines also involved in asthma. ATI-2341, pepducin targeting the C-X-C chemokine receptor type 4 (CXCR4), is an allosteric agonist activating the inhibitory heterotrimeric G protein (Gi) to promote inhibition of cAMP production and induce calcium mobilization.